Last week in Part 5 we looked at how using just a turbo boost gauge and a cheaply bought accelerometer can yield really useful information on best gear-change points, the shape of the torque curve and the actual on-road performance changes of modifications. But that was all in a straight line – now what about corners? Describing and measuring vehicle handling is a very different ball game to the techniques I’ve so far covered in this ‘tool-kit’ series. For example, the greater the pressure drop through the intake system, or the slower the turbo boost is to rise, the worse will be the performance – no question about it. But with handling, my ‘good handling’ car may not be your good handling car. My ‘excellent steering response’ may be your twitchy steering – and so on. While handling can be measured with numbers (and we’ll cover one approach in a moment), often it is best if it is evaluated subjectively – both the car’s standard handling and after it’s modified. In short, the primary tool-kit becomes the descriptive terms that you apply, rather than the numbers you measure. Understeer is when the cornering car does not turn as sharply as the amount of steering lock indicates it should. In other words, the front of the car is sliding. A car that understeers off the road does so with the front still facing the original direction. Understeer is safer than oversteer and so all car manufacturers set their cars up to understeer when grip levels are exceeded. A car with plough understeer has completely stopped responding to steering inputs – turning the wheel further makes no difference to the direction the car is headed. Plough understeer is dangerous because steering control has been lost. Power understeer means that the understeer increases when more power is applied. This normally applies to front-wheel drive cars. Power understeer can be remedied by reducing power, so transferring weight forwards and also reducing the work the front tyres need to do. 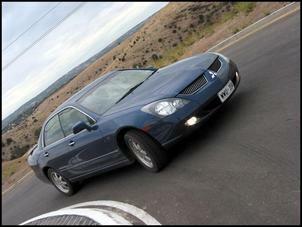 Turn-in understeer is when the car is slow to respond to the steering when it is first applied. High speed turn-in understeer can be very disconcerting because it feels as though you will not make the corner – and it doesn’t feel like there is much you can do about it! Oversteer is where the car turns to a greater degree than the steering indicates it should. In other words, the rear of the car is sliding. A car that oversteers off the road is spinning, so it may hit sideways or tail-first (or even do a 360 degree spin, hitting nose first!). An oversteering car can be felt to be rotating around you. 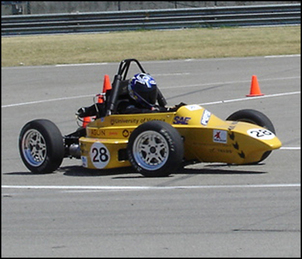 A car with power oversteer has increasing oversteer with the application of more power. This normally applies to rear wheel drive cars. Power oversteer can be remedied by gently reducing power. Lift-off oversteer occurs when the throttle is abruptly raised mid-corner. 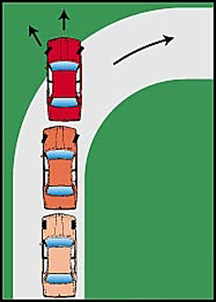 This normally applies to front-wheel drive cars but will occur in any car with high rear roll stiffness. A car that lift-off oversteers will normally tuck-in if the throttle lift isn’t so great – that is, the front will stop understeering. 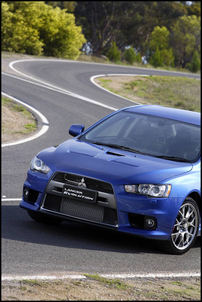 Turn-in oversteer is when the car initially turns-in more than the steering angle requested. This is very disconcerting because, as with turn-in understeer, it’s not immediately apparent what can be done to stop it. Bump steer occurs when the wheels change their toe angles (the direction they’re pointed in) as the suspension moves up and down. It’s generally most easily felt on turn-in, when a suspension with toe-in on bump will have turn-in oversteer (it will twitchily turn-in more than expected) and a suspension with toe-out on bump will have turn-in understeer. A car with linear roll is progressive in its roll, with the angle of roll being directly related to how hard the car is cornering. A car with non-linear roll may rapidly lean on turn-in but then not lean any further as the cornering load increases. Roll linearity is seldom mentioned but it is very important in giving the driver the correct signals as to what is occurring. This describes how rapidly the car responds to driver inputs. A twitchy car will respond very rapidly to steering and power inputs. In a road car this tends to be tiring and at times disconcerting. However, a car that is the extreme opposite to ‘twitchy’ will feel dull and unresponsive. Stiff bump damping and stiff sway bars are two characteristics that will make a car twitchy. A car that is on the edge of sliding (either understeer or oversteer) and can then be moved into a slightly sliding state by a variation in power is said to be being throttle-steered. Throttle steering requires a very well balanced car with an engine that has a linear torque response (so not a little engine with a big turbo!). The above terms give you the vocabulary – but how do you apply it? 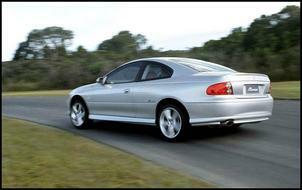 Firstly, to initially explore the handling of a car, the car does not need to be driven fast. One of the first things I do in a car new to me is to drive down a straight road, making quick but minor left/right/left/right steering inputs. Does the vehicle respond quickly or slowly? Is the steering around centre linear or does little happen – and then as the wheel is turned further, suddenly a lot? Is vehicle roll in proportion to the sideways forces (ie how good is the roll linearity)? The next step is to apply power while cornering – and explore the areas of power oversteer, power understeer, plough understeer and so on. The slipperier the surface, the lower the speeds (ie safer) at which this exploration can be conducted. Finally, higher speed characteristics (eg turn-in oversteer), twitchiness and bump steer can be tested. 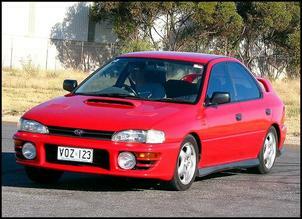 There is one area of car handling where numbers can work very well – skid-pan testing. So what is a skidpan? Throw out any ideas you might have of drift merchants circulating a piece of bitumen in a lurid tail-out slide. Instead, picture a skidpan as simply being a marked circle around which the vehicle is quickly driven. Rather than a place to do slides, think of it as a corner that never ends. The ‘continuous corner’ idea immediately highlights the importance of a skidpan. Instead of being able to use a traditional cornering ‘slow-in, fast-out’ approach, you have to maintain the cornering line. Rather than following a ‘racing line’, the line you follow is prescribed. Rather than being able to get a higher cornering power for just an instant, it must be held continuously. And to negotiate the never-ending corner, the steering must be accurate and sensitive, the motive power must be able to generate enough power to keep you going around as fast as possible, the tyres must continue to develop adequate grip, and the oversteer/understeer balance must be good enough to allow the driver to keep all the wheels pointing as much as possible in the direction of the corner. Because, if any of these things cannot be achieved, you’ll be going slower! And the aim of a skidpan is to go as fast as possible around the marked circle of a known diameter. If you know the diameter of the circle and how long it takes the vehicle to get around it, you can then work out the vehicle’s maximum lateral grip (“cornering g’s”). This number represents the fastest that a vehicle can go around a continuous corner, or to put it another way, the maximum sideways grip it can develop – usually, on a smooth, dry surface. Being able to directly measure the maximum sideways grip is a fantastically easy way of finding out something that is otherwise very hard to accurately calculate. When the discussion is of unusual vehicle designs (for example, tilting three wheelers), skidpan testing represents an easy way of sorting fact from fiction. For conventional vehicle designs, or ones where evaluating of handling rather than pure grip is required, the skidpan is again extraordinarily useful. On a skidpan the fundamental steady-state handling traits can be explored – for example, the understeer/oversteer balance. In addition, the response of the vehicle to power changes is very easily determined - for example, whether the car throttle-lift oversteers. It is much easier to feel these aspects when continuously cornering than it is when only ducking in and out of corners. I use skidpan testing a lot - and I do it in two quite different ways. The first could perhaps be called ‘informal’ – whenever I have a new car to test, I make sure that at some point I drive it very hard around a medium/large sized empty roundabout. I enter the roundabout relatively slowly and then accelerate to the point at which the car is sliding. 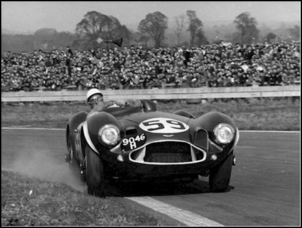 In every current car the front will lose grip first – it will understeer. I then lift the throttle fairly quickly and see what happens when the weight transfers forward. In many front-wheel drive cars, the front will tuck-in and in some, the rear will slide into oversteer. In rear wheel drive cars, the application of more power will cancel the front understeer and push the car into oversteer. Clearly, sliding cars around public road roundabouts is quite politically incorrect – and may in fact be illegal in some jurisdictions. Any use by you of the technique is completely at your own risk – and also note that it requires far more skill than is shown by many drivers. However, as stated above, I am emphatically not talking about drift-style slides; instead, an observer would probably not even realise the car was sliding. If the steering wheel of the understeering car is turned so far that it is ploughing, you have not been listening to the car. If the steering is turned so far in opposite lock that it can even be noticed from the outside, you have let things go way too far. The beauty of an increasing speed skidpan test is that things happen relatively slowly and with plenty of warning; as a result, the corrections of steering and throttle can be achieved with subtlety. Exactly the same test procedure applies to cars with stability control; in fact, this is a really good way of feeling its characteristics. Some manufacturers allow quite a lot of driver control of a sliding car, while others shut things down very quickly. I also suggest that a roundabout skidpan test is by far the safest way of road assessing a car that has had handling modifications. Especially when making mods that result in lift-off oversteer (for example, stiffer rear springs and/or rear anti-roll bar), it’s vital to feel the car’s behaviour when the car is on the edge of sliding. In these types of testing, the time taken to negotiate the skidpan circle is of far less importance that using the test to feel the car’s characteristics. 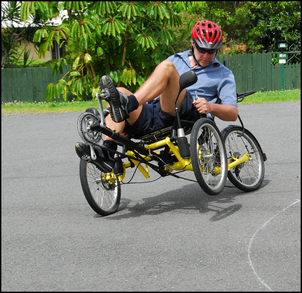 The other skidpan testing that I do is on the Human Powered Vehicles (HPVs) that I have developed. In the field of HPVs there are some very innovative designs – three wheelers that have wheels that lean into the corner, machines with ultra-low centres of gravity, and those that tilt the rider. Assessing the cornering prowess of these machines solely from their specifications is impossible, whereas a simple skidpan test will soon show the maximum continuous cornering power. Finding out the on-road reality is especially important when (apparently) some of these machines cannot be pedalled while being cornered hard, and (apparently) others are difficult to balance when being cornered at max potential. It’s also illuminating to note that many of these more exotic machines are said by their owner/developers to handle like “they’re on rails”! I use a 6 metre diameter circle marked with chalk on the roadway outside my house. I am fortunate to live at the end of a quiet cul de sac and while the neighbours look on with puzzled amusement at my testing, no-one has ever complained. Timing is by an observer with a stopwatch. ...where radius is in metres, time is in seconds and the answer is in metres per second per second. Divide this by 9.81 to get the results in g’s. Skidpan testing has proved to be of great use to me in making comparisons of variations in fundamental designs, tyre pressures and ride heights. Especially on three-wheel machines that will tip when their limit is exceeded, it is also a good test of steering sensitivity and precision – good steering is needed to keep a trike balanced on the edge (or not balanced, as the above pic shows!). Of course, there are many aspects of grip and handling where a skidpan is useless. Turn-in handling behaviour cannot be assessed, the poise of the vehicle under hard braking is never judged, and it would be a fatal mistake to assume that a vehicle with a higher lateral ‘g’ figure is always going to out-handle one with a lower figure. The other side of the coin to handling is ride quality. Again, while it is easy to measure data such as vertical acceleration (and only a little less easy to measures rates of change of that vertical acceleration), in the real world, a subjective analysis is more useful. Three aspects of ride can be easily judged. This refers to the hardness of the ride when small, abrupt bumps are met – eg a sharp-edged pot-hole, or a rock lying on the road. The impact hardness that is felt is largely dependent on three aspects of the suspension – the tyre (profile and pressure), the spring stiffness and high speed bump damping. (The latter two are virtually indistinguishable to the occupant of the car.) The effect of the tyres is easily separated from the springs and dampers – if the tyre profile is too low, the ride feels like the tyre pressures are overly high, even when they are not. ‘Low speed damping’ refers to the damper shaft speed, rather than the car speed. Low speed damping is the sort felt after the car has passed over a wave in the road. Does the car body continue to bounce or is the vertical motion quickly quelled? Or, is the motion stopped so fast that the ride feels too firm? All vehicles use firmer rebound than bump damping. This is because, unlike bump damping, rebound damping does not make the impact of bumps harsher. However, a car can have too firm a rebound damping. The affect of this is hard to describe, but it can be clearly felt. What happens is that rather than being fast accelerated upwards over bumps, you feel yourself being pulled down harder. In other words, the bumps feel oddly reversed. In this sort of series it’s easy to suggest techniques that look great on paper but, in the real world, aren’t all that useful. So for example, the accelerometer described in Part 5 can be turned sideways and cornering acceleration can be measured. But I have found skid-pan testing (and if necessary, timing the vehicle’s speed around it) to be far more useful than using an on-board accelerometer. It’s also easy to say that road car handling should be evaluated only on a racetrack, but that is out of the question for many (most?) people, and anyway, track handling prowess is not the same as road handling prowess. The techniques of evaluating ride and handling that I’ve covered here are useful on all road vehicles, cost little or nothing, and can vastly improve your modification outcomes. Next week: interpreting performance – and wrapping-up the series.